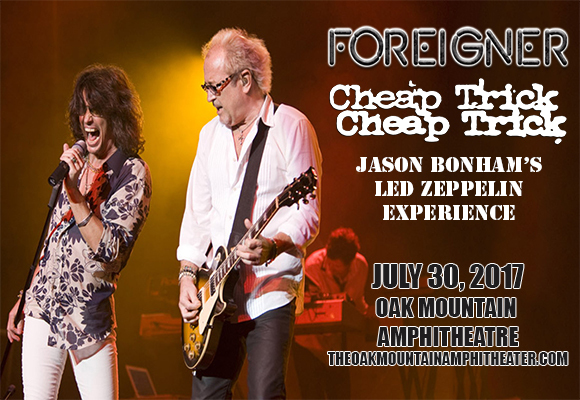 It's a triple-whammy of classic rock as Foreigner, Cheap Trick & Jason Bonham's Led Zeppelin Experience come to Oak Mountain Amphitheatre on Sunday 30th July 2017! Get ready for an evening of nostalgia, massive hits and heavy riffs as these titans of music take to the stage to celebrat Foreigner's 40th anniversary! British-American rock band Foreigner began in 1976, in New York City and chose their name to reflect the group's mixed heritage. Releasing their eponymous debut album in 1977, selling more than four million copies in the United States and staying in the Top 20 for a year, the band went on to become one of the world's best-selling groups of all time, with worldwide sales of more than 80 million records, including 37.5 million records in the US. They have had fourteen Top 20 Hot 100 hits (1984's hit single "I Want To Know What Love Is" went to No. 1 in both the US and UK) and six consecutive multi-platinum albums between 1977-84.